Today, I'm happy to be hosting a very talented mom and blogger, Angelina. She's a mom of eight, blogger, former homeschooler, singer, baker, photographer, and much more! I'll let her introduce herself below, but a word on the topic she's written about. Our children learn as much from everyday life as they do at school or through formal instruments of learning like books. These tips by Angelina will really help busy moms find a way to introduce learning into everyday activities. Hello! I'm thrilled to guest blog over here at Sand in My Toes, home of the lovely mother and blogger Tarana. I'm Angelina and I blog over at The mommy talks. 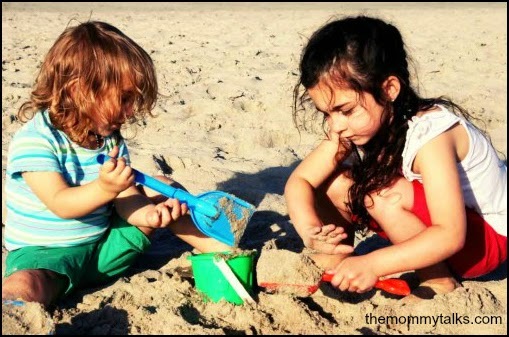 Most of my blog is about my three youngest of eight kids! In this blog post I would like to talk about a few ideas we've used in our family to teach and give input to our kids, even when it wasn't ‘classroom’ time or homework time, or even times when I was busy and couldn't really give the kids my full attention (which, let's face it, is a lot of the time!). We all know that young children absolutely thrive on input - the more input they receive the more challenged, fulfilled and happy they are. When a child is learning or involved in something and enjoying it, boredom and bad behaviour are significantly reduced. There's a lot of information out there - all sorts of things you can do with your child from the time they're a baby till you send them off to college, and that's all great. But there is something to be said for the in between times as well. And as a mother of even just one young child in today’s fast-paced world, you may often find it challenging to fit all that you need to do into each day, and that spending quality time with your child is getting squeezed out. This is true both in the case of a mother who does everything that she must do with her children, such as errands, cooking, and cleaning, as well as a mother who works outside of the home and doesn't have as much time with her children as she would like. Although we wish we could spend hours reading with them, guiding them through arts and crafts activities, teaching them counting, learning colors and ABCs - and as wonderful as these things are - sometimes it is just not possible. If you are experiencing this or something similar, fret not! There is still so much you can do with your youngster by turning everyday occurrences such as shopping or washing the dishes into a learning experience which will be enjoyable for both of you! You may be surprised at how much you really can teach your child if you look for the opportunities throughout the day. You can do this while you are driving, shopping, cooking, walking to the mailbox, or any other time when your kids are around but you still have to do something else! Here are a few fun ideas to get you started, and once you do start, you will most likely both love it so much, you will come up with ideas of your own that work for you and your child! 1. Simple counting and math games with food. Sort candy by colours. Have them point to a colour you call out. They can eat it if they get it right! You could also have them practice their counting or make simple patterns. Small snacks such as goldfish, raisins, gummy bears, and M&M's are fun foods that kids love and are easy to handle. But if you'd rather not use snacks, small objects or toys such as cars, stickers, or blocks can be used. 2. Use bath time for teaching! Teach floating and sinking in the bath. Talk about bubbles being full of air, or how soap and water wash off the dirty germs which make us sick. Give your child washable paints or crayons and have them draw in the bath or trace big numbers or letters. You can also give your child fun things to practice pouring or squeezing in the bath for fun fine motor skill play, such as big turkey basters, sponges and funnels. 3. Find objects of a certain colour while out or in a store. For example, find all the white cars, red signs, pink shirts, purple shoes, yellow towels, etc. Try the same thing with easy shapes. You could see how many of a certain object you can count, or count up to ten or twenty of one object and then choose a new one to count. 4. On a walk or in the car: Talk about the way things move. For example, trees sway, birds’ wings flap up and down, airplanes soar, bees fly, and wheels turn around. People walk, run, cycle, drive, ride, jog, jump, hop, or skip. Introduce new and interesting vocabulary to your young ones. Children are like sponges, and they feel very happy with themselves when they learn 'big people' things! 5. In the backyard discover roots, stems, petals, seeds, trunks, bark, bugs, and more. While you are cooking you can tell your child to bring you different things from the garden for you to talk about together. Talk about the difference between things that are alive or made. Are rocks alive? Do they grow? Do they eat? What about grass or flowers? What about the fence, trampoline, or the twigs on the ground? 6. Teach an educational rhyme or song. Do this while you are busy doing something else, and then quote or sing it together. This is a favorite, and so easy! 7. When eating, talk about where food originally comes from. For example, if your child is eating cheese or any other dairy-based snack, talk about where milk comes from. Introduce vocabulary such as orchards, farm, cows, milking, trucks, bottles, baskets, picking, dairy, harvest, farmer, market, cheese, butter, cream, yogurt, chicken, eggs, wheat, corn, flour, etc. Have your child tell a story about how a certain food came to us, such as pancakes, eggs, or salad. 8.Tell your child to do little performances. You could also teach prepositions in the same manner. For example, Stand next to the ball and then jump over it, or Crawl under the chair or Hide behind the teddy, then hop in front of it. 9. Supermarkets are a great place to teach your child all sorts of things. From the colours of vegetables, to helping you count, weigh, add, subtract, etc. You could also teach them prepositions, right and left, as well as following directions. For example, Help me find the cucumbers, which are straight down and to the right on the bottom shelf. Go with them and find it with them so they get the hang of it. Use the words, big, bigger, biggest, and small, smaller and smallest, tall, short, wide, narrow, etc. to compare the sizes of the trees, buildings, cars, and any other objects that you pass while driving. Little kids LOVE helping and one of the easiest things for them to help with is washing the fruits and veggies. Just set them up with a big bowl of water and a sponge and let them have fun and feel useful! And if they are old enough, they can even help peel the potatoes, carrots, cucumbers or anything else that needs peeling! Like I said, these are just a few ideas of some things we've done. What’s really wonderful about this is that your child will love doing and learning these things with you, as children just can’t get enough of learning new things. They will also love that they get to do it with their favourite person! Another benefit of doing these little learning activities with them throughout the day is that it helps to keep them out of trouble. It also heightens their awareness to their surroundings and all they can learn! Just remember: Do what you feel comfortable with and have fun together! Angelina Johnson is the blogger and mother behind the blog, The mommy talks. She is a lover of easy and beautiful DIY home making and is always looking for shortcuts and hacks, especially when it comes to cooking for her eight children! Her hobbies include photography, graphic arts, and finding new and inventive ways to successfully load the dishwasher! You can connect with her on Google Plus, Twitter, and Facebook. If you loved this post, don't forget to share! Great post! 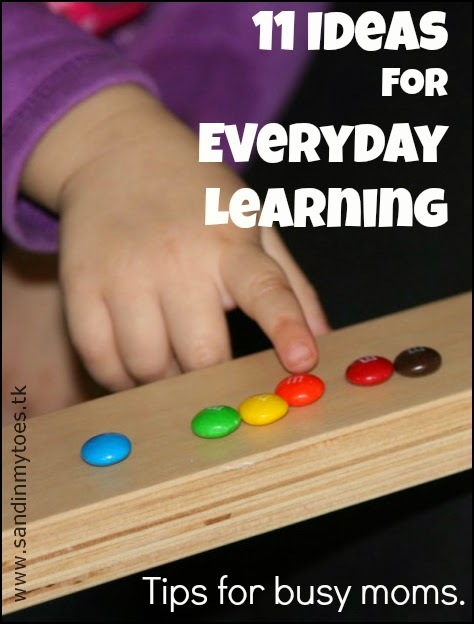 There are so many simple ways to learn every day! Thanks MaryAnne, I love these ideas too! Love the bath and shopping ideas. So simple and really effective too! There's always a learning opportunity lurking somewhere! Glad you liked Ang's post. Really fab tips and think so ordinary that you almost don't think of it! Will definitely use a lot more of these opportunities! Good to know you found some new ideas! That's true, it does happen naturally!